Audiences are less than four months away from the release of Star Wars: The Force Awakens and J.J. Abrams and his crew are still keeping certain things under wraps (we still haven’t seen Luke Skywalker in full Jedi Master regalia, for example). On the eve of Disney’s D23 fan convention, Entertainment Weekly has published 12 exclusive photos from the newest entry in George Lucas’ space opera series. In the accompanying interview, the notoriously tight-lipped Abrams dropped a few hints that may lead to bigger revelations, or may simply be dark side trickery. 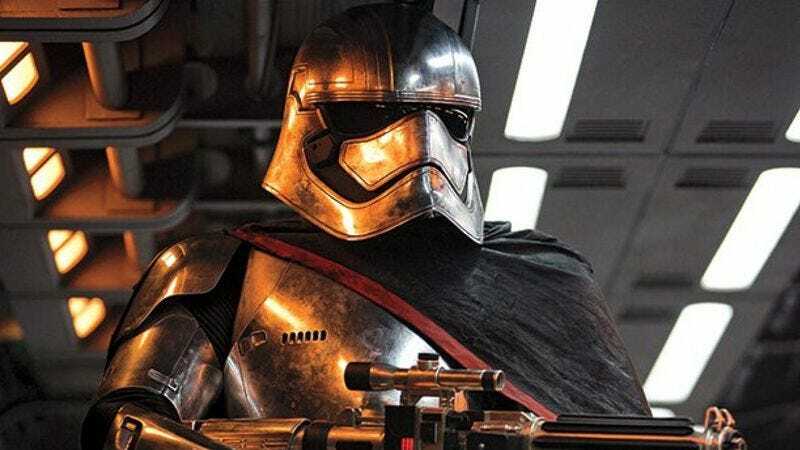 Apparently Kylo Ren, portrayed by Adam Driver, loves Darth Vader and loves his show: “The movie explains the organs of [Kylo’s] mask and where it’s from, but the design was meant to be a nod to the Vader mask.” Abrams says. On the subject of the name, Abrams continues, “He is a character who came to the name Kylo Ren when he joined a group called the Knights Of Ren.” So if Ren’s not his real name—simply a title like “Darth”— then what is? Solo? Skywalker? The good money is on Skywalker, because everyone seems to be related to that dysfunctional family. Star Wars: Episode VII—The Force Awakens opens December 18th, and you can see the rest of EW’s exclusive photo set over on its website.